Inside Out and Back Again was my "lunch hour" book for a few days, so here it is on my desk at the library. it's been co-o-o-ld here in Orange County and I've been bundling up! Lai, Thanhha. Inside Out and Back Again. 272 p. HarperCollins. 2011. Hardcover $15.99. ISBN 9780061962783. I'm still thinking about this book, reflecting on it several days after finishing it. Reading the author's story of her family's escape from Vietnam just before the fall of Saigon felt personal for me. My husband was born here in California, but his family, too, escaped Vietnam in 1975. His family rarely mentions their refugee experience because it was so harrowing. The memories are too difficult to talk about, too overwhelming to bring to the surface. The older generation doesn’t want to “burden” their children by discussing what they went through. I think it’s really important, therefore, that Thanhha Lai has written her family's story. It's fictionalized, yes, but as I understand it, still very much the truth of her own experience, and reflects the stories of so many who escaped Vietnam at that time. Through this poignant novel in verse, younger generations of Vietnamese-Americans can gain perspective on the pain and trauma their parents and grandparents endured to give them the life they lead now. Even without the personal connection, this is an intensely powerful book. Readers don’t have to be Vietnamese-American or be connected to refugees in any way to feel their heart rate increase as the tension of war infiltrates daily life, perch on the edge of their seat during the desperate escape on a crowded ship, or sigh with empathy at the bullying young Hà endures as she struggles to adapt to her new life in the United States. Headstrong Hà is a relatable protagonist and a keen observer of the world around her. Young readers will champion her for getting angry at the frustrations and limitations she faces as a refugee trying to learn a new language and culture. Lai doesn't sugar-coat, and the effect is stunningly real. The verse format is a perfect fit for her story, eliciting heartbreak or laughter with just a few words. A fairly quick read that's well worth lingering over, Inside Out and Back Again is the winner of the 2011 National Book Award for Young People's Literature. I've been interested in reading this book for a while. Poetry can be the most appropriate and meaningful medium to tell a difficult story. 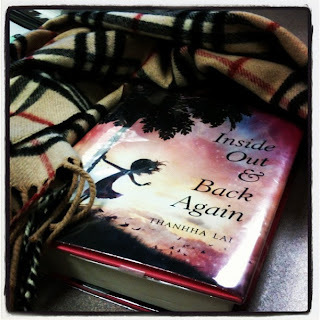 Lai wrote Inside Out & Back Again in a spare, poetic prose style meant to reflect in English what it's like to think in Vietnamese. "Vietnamese is so lyrical, and 80% percent of it is derived from Chinese, which is a language built from pictures not words. So this format and voice came out of that desire." Thanks for the comment, Katie! I'll look forward to reading your review of this wonderful book. I agree with your thoughts on it. I loved that there was humor mixed in with the suspense and sadness. Oh, and thanks for the compliment on my scarf! Haha, I'm always excited for cold days in Southern California so I can actually wear it. I had no idea this was written in verse! The book is listed on an IL library list so I definitely plan on reading it. Thanks for the review. 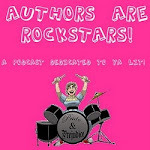 Book bloggers: What to do with those old ARCs?